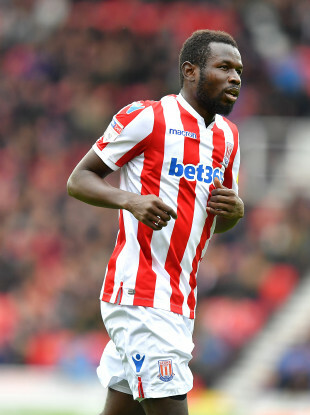 Mame Biram Diouf, Stoke City (file pic). MAME DIOUF HAS hit out at Stoke City fans for their barrage of criticism, as he considers a summer exit from the Championship club. Diouf has fallen out-of-favour this season, playing only 15 games across all competitions, excluding an appearance for the U23s, where he scored a brace in early March. With no efforts recorded so far in the 2018-19 season, it is turning out to be his most frustrating campaign in front of goal since his arrival from Hannover 96 in 2014. Upon his return to the Premier League after stints at Blackburn Rovers and Manchester United, Diouf ended his debut campaign at the bet365 Stadium with 12 goals in 38 matches, as they finished ninth in the league table. The Senegal international has a year left on his contract with several Turkish Super Lig clubs lining up for his services in the summer, but he disclosed why he thinks his club’s fans are different from the others. “They’ve loved me too much here. That’s why I’m sad about the current situation, because Stoke means a lot to me,” Diouf told So Foot. “English fans are demanding, but, frankly, our fans are the worst. Diouf dominantly plays the role of a striker but Mark Hughes tried switching him to a winger on his return to club duty after the unfortunate death of his mother back in the 2015-16 season. The following season, the 31-year-old played the entire campaign as a wing-back, but he has stated that he can not carry on with the role again, which leaves him in competition against Saido Berahino, Sam Vokes, Bojan and Benik Afobe for the number nine position. “I really tried, but I can’t do it,” he added. Diouf was an unused substitute as Rotherham United held Stoke City to a 2-2 draw in Saturday’s Championship outing and the result moved them down to 16th in the table with 13 points adrift of the playoffs. Email “'Our fans are the worst' - Mame Diouf considering Stoke City exit”. Feedback on “'Our fans are the worst' - Mame Diouf considering Stoke City exit”.